Is this the ARF tested method? Could have used clear coat or something? I personally would not have done it that way. Looks like...........well lets face it. PooP. If you mean the smear across the undercase label, I think that's just the old glue that Crosley slathered on there that has turned color over the years. I've seen that glue around labels before but never slopped on like that. May have been a disgruntled Crosleyite. Thats normal for a Crosley. It was done at the factory. I think it was done to help the label stay on. I have seen many Crosleys like that. Well now I have seen another. Just picked one up at a flea market. Gave to much 30 bucks, but I wanted it. "Picks up static." Whats that tell us? 25 tabletops, 1 console, 1 console phono/radio and counting. 1 console Admiral phono/radio I am keeping my eye on for parts. The cabinet is shot. Looks sloppy now, but how often do people turn radios upside down to read labels? His name was the forerunner to the Sloppy Joe. Would have been clear when it was new. So, in retrospect, ( I always wanted to use that word) The aging of the glue gives it some authenticity, so to speak? Damn, I just realized this radio is as old as my wife. They musta used a better glue on her. She's standing right there, right? Perfectly normal for that model of Crosley. Now for the purists, who would you reate that effect when applying your freshly printed label on your repaint? Just use a little toner with the glue perhaps?. Use a basting brush to sloppily apply, and slap it on . Just like you were doing hundreds on the assemble line. Th sloppy application adds character to those, and other models where a label placement is not a priority. 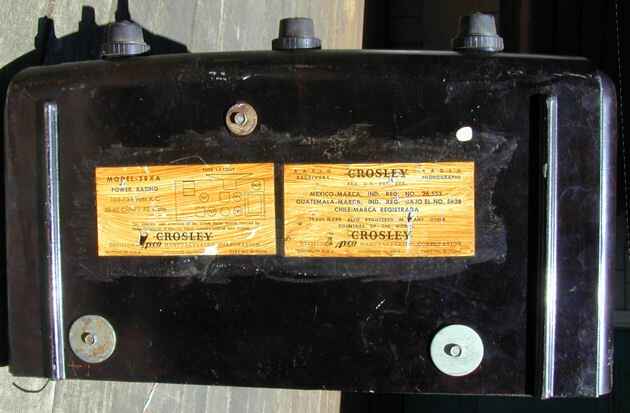 Crosley is not the only company to slop glue on like that. I have seen Magnavox & RCA Tv sets and others too. How is progress on new home for ARF? You're asking the "wrong" Alan !! But it is a Good question I'd like to get my 38-690 info BACK!! Your Conscience doesn’t Stop you from doing Wrong-But it DOES stop you from Enjoying IT!! Subject: Re: Is this the ARF tested method?